In a recently released study on holiday shopping, Lazada ranked as the go to shopping website for Filipinos. Since its inception in 2012, Lazada Philippines has grown to become the leading online shopping and selling destination in the country. With over 10 million ecommerce buyers today, Mr. Balci believes that the Philippines can be the online shopping capital of the world. With an additional 63 million active Facebook users, Lazada has a huge consumer base to fuel seller growth. More than 12,000 active sellers have already found sustainability and success on Lazada’s platform. These sellers, offering a wide assortment of products (electronics, fashion, home & living, health and beauty among a few) now reach customers in Luzon, Visayas and Mindanao. Isaac Saliendra, one of Lazada’s sellers, shared his success story: “At the age of 19, I started selling fashion bags on Lazada. Four years later, this remains to be my main source of income. Lazada gave me tools I needed to realize my dreams of becoming my own boss in a mobile-driven world." “Lazada is the great equalizer. New York Sneakers, which is a purely digital store has been able to compete with top local and multinational shoe brands on the platform” said Tracie Lyn Artificio, a proud Lazada merchant. Last October 6, a conference for sellers was held to officially launch the biggest shopping event of the year – Online Revolution. With the theme “Shop the Universe,” Lazada executives shared business strategies and tools for sellers to make the most out of the month-long shopping event. This year's Online Revolution, from November 9 to December 12, expects to double the visits from last year’s record, with an expected 150 million visits. Best of all, sales uplift for sellers are expected to triple last year’s performance. Sellers can make the most out of this time by utilizing new tools to grow their business. 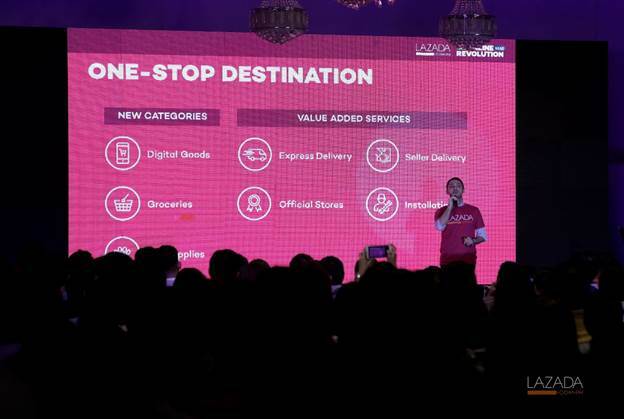 Lazada will be launching its Seller Revolution program on October 10. Entrepreneurs can join an online sign-up caravan where new sellers will get free marketing mileage during Online Revolution as well as other seller perks. Visit https://www.lazada.com.ph/seller-revolution/ to learn more on how to become a Lazada merchant and reap the benefits of online selling.